When companies have high risk projects and need expert opinion on conducting the work, while ensuring the safety of personnel and compliance with government regulations, they call Zokal for expert consultation and management of the high risk activities. Daracon needed to lower a worker 7m into the vertical casing that would later be filled with concrete to form the pilons. The person entering the confined space would have to join the vertical torsion bars and align them for the engineers. This presented a number of challenges as it involved both height safety and confined space entries for the 20m deep casings for the reinforcement bars for the new bridge footings. A specialist was needed to manage the potential hazards and set up safe entry for the worker. This job also had serious time constraints due to the rail shut down which allowed a small window to complete the replacement. Zokal attended onsite meetings with all stakeholders prior to the job to scope the task, potential hazards, controls, rescue plan required equipment and procedures. We then set up a tripod and rope positioning device to lower the worker into position. We also set up confined space safety protocol including a standby and rescue plan as there was potential for gases, vapour and low o2 in the casing. Adjacent to the vertical casing was the rail corridor and mobile equipment being used for the bridge replacement including drill rigs, cranes, cement truck and associated workers. Zokal consultants remained on call for the duration of the job so as the casings became available we could immediately set up our confined space entry equipment for the engineer to perform their duties in the casings. 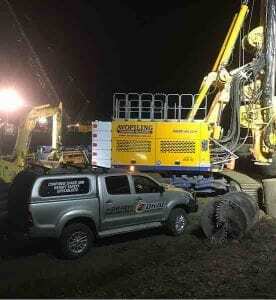 This flexibility and efficiency while on site ensured each component of the job was completed safely on time. 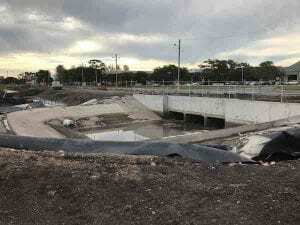 Engineers had found potentially contaminated ground water was penetrating through the new drainage system into the Hunter River. Workers would need to access the culverts and tunnels to drill holes through the concrete into the substrata and inject a chemical paste to seal the cracks, cavities and voids. This would eliminate any ground water penetrating through the drainage system. This would expose the workers to confined space hazards. 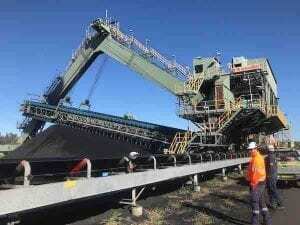 They needed a specialist contractor to ensure the workers were not at risk during the operation. Zokal high risk consultants were employed to manage the confined space safety during this operation. Our high risk consultants conducted a full crawl through of the 40 metre tunnels with Breathing Apparatus to has test each of the 3 tunnels for potentially hazardous atmospheres before technicians could access the space to perform the necessary repairs. The Zokal team implemented confined space safety procedures during the repair to ensure the safety of the technicians in the confined space and remained on standby for the duration of the repairs to effect a rescue if required. During this week long project, the EPA conducted an unscheduled onsite inspection and audit of the project and safety systems. All aspects of the project including the environmental and safety requirements passed with the job finishing on time with zero safety incidents. Technicians needed to access a coal reclaimer to conduct vital inspections and non-destructive testing on all critical components of the equipment. This involved both height safety and confined space challenges. Entry to the structure was via rope access through a manhole at the base of the A-frame. The Zokal technicians then climbed 50m internally to install temporary rope access systems for the engineers to use to safely inspect the entire structure. Rescue plans were established with the need for full rope access for retrieval if necessary. This has become the ongoing inspection procedure that is now completed annually. Technicians have been trained in both confined space and heights safety to successfully penetrate up the incline of the internal A-frame and conduct their non-destructive testing. An Offshore Port Marker Bouy, was needed to provide navigation and lighting, for ships entering the Newcastle Harbour. Maintenance is required on all aspects of the marker including the solar panels, batteries and lighting. A system was needed to allow technicians to safely access all components that needed to be maintained. Zokal technicians were tasked with installing a Lad-Saf fixed ladder safety system on the buoy. This Lad-Saf system enables maintenance crew to safely access the vertical tower, complying with all relevant heights safety legislation, standards and codes of practice. 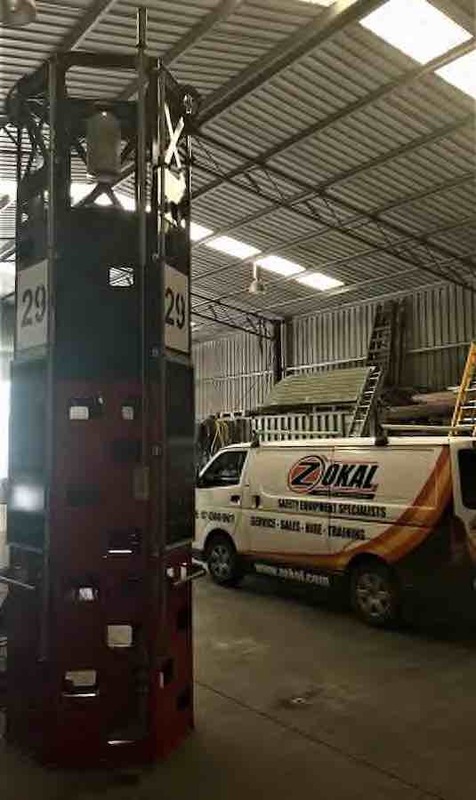 Zokal technicians assembled and installed the safety system in a Newcastle workshop ready for the marker buoy to be loaded onto transport for positioning offshore.